A remarkable meeting of minds took place in California last month on April 20 and 21. Stanford University was the scene for the second annual Breakthrough Discuss, where scientists from a variety of fields came together to tackle arguably the greatest question we have ever faced – are we alone in the universe? The event was part of Breakthrough Initiatives, a bold program started by Russian billionaire Yuri Milner to spark advancements in the search for life. This includes searching for alien signals via Breakthrough Listen and potentially traveling to Proxima b, the closest exoplanet to Earth, with Breakthrough Starshot. The idea of Breakthrough Discuss was not only to talk about these ventures, but also to explore the broader search for life. This includes finding potentially habitable worlds around nearby stars like the TRAPPIST-1 system and more recent discoveries relating to Enceladus. There were also discussions on the possibility of finding signals from aliens, known as the search for extraterrestrial intelligence (SETI). Breakthrough Discuss began with a series of talks on red dwarf stars and their potential for hosting life. The idea has come to the fore recently, particularly with places like TRAPPIST-1 40 light-years away found to have multiple rocky planets in orbit. Red dwarfs are the most numerous stars in our galaxy, and their relative dimness compared to our Sun makes it easier to see and study the planets in orbit around them. It’s still not clear if a planet in orbit around a red dwarf can be habitable; the stars are temperamental and prone to flaring. But they are undoubtedly attractive targets, and they may be some of the best places to look for life. Just the other day, a new planet was found around the red dwarf LHS 1140b, also about 40 light-years away, which has been heralded as a great place to look. Guillem Anglada-Escudé from Queen Mary University of London gave the keynote talk of the conference, discussing how he and his team were going to study the nearest red dwarfs for planets. We already know Proxima Centauri 4.2 light-years away plays host to at least one – Proxima b – and it may have more. Now, Anglada-Escudé and his team will shift their focus to Barnard’s Star 6 light-years away, and other nearby red dwarfs, as part of a new project called Red Dots to find nearby planets. We should know by the end of the year if there’s anything there. Finding these planets is only the first part, though. A number of scientists are now investigating what techniques we can use to work out if they have any life on them. Direct imaging of the surfaces will be next to impossible, so instead we’ll need to examine the atmospheres of the planets by studying the light that comes through them from their host star. Most of the work in this area focuses on a handful of molecules such as oxygen and methane, but in total there are 1,500 molecules that could be useful. Huge upcoming ground-based telescopes – known as Extremely Large Telescopes (ELTs) – like the upcoming Thirty Meter Telescope in Hawaii and the Giant Magellan Telescope in Chile will help in this endeavor, as will NASA’s upcoming James Webb Space Telescope (JWST). The field has changed dramatically in just a few years. In 2009, when NASA launched its Kepler Telescope, we still weren’t sure how common planets were around other stars. Now we know of thousands, and we’re honing in on some that could be habitable. Every star is now thought to host at least one planet on average, and likely many more. And the question of finding life is the driving factor of it all. We’ve got no idea if life like that on our planet is common, or if we’re a rare gem in a dead universe. We may be able to answer that question inside our own Solar System, with places like Enceladus and Europa looking like they may have the necessary conditions for life. But exoplanets carry an almost equal allure. The idea that life might be common in the universe has also driven SETI for decades, with early pioneers like Frank Drake in 1960 suggesting we might be able to hear signals from advanced civilizations around other stars. 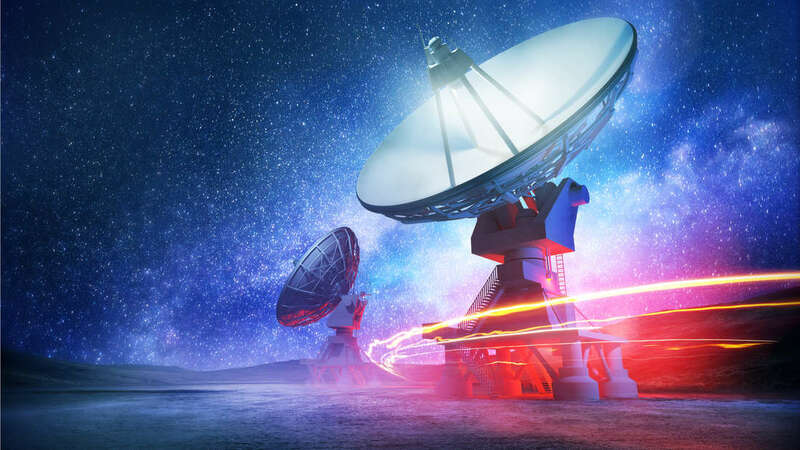 SETI has struggled for funding over the years, but Milner’s injection of $100 million ensures the search will continue for at least 10 years as part of Breakthrough Listen. Truth be told, it was somewhat of an odd marriage seeing SETI discussed alongside more grounded science at Breakthrough Discuss. The prospect of finding a signal from an alien civilization is still far-fetched; in six decades of searching, we’ve found nothing. It’s often said that if we don’t look we’ll never know, but SETI remains somewhat fanciful. That’s not to say there might be nothing out there, and it might well be worth the search. Andrew Siemion, director of the Berkeley SETI Research Center, presented the first scientific results from the first year of the Breakthrough Listen project, on which he is also the lead. While nothing was found, this is one of the most extensive searches to date. If it draws a blank after a decade, well, that may force a rethink. “At what point do we give up on SETI?” a panel of experts at Breakthrough Discuss was asked. “Not any time soon,” replied Tarter. And then there was the grand finale, the discussion about actually sending a spacecraft to a planet around another star. This project, called Breakthrough Starshot, was announced in April 2016 to considerable fanfare. Using a giant laser on Earth, a small chip with a massive sail would be accelerated to one-fifth the speed of light, reaching Proxima Centauri – and thus Proxima b – in just 20 years. Breakthrough Discuss, however, highlighted just how difficult such a proposal might be. One attendee told IFLScience that they thought the project was now less likely to happen that it was a year prior, based on the huge number of challenges that have become apparent. One is actually firing the laser at the spacecraft in the first place, laid bare by Zac Manchester from Harvard University in a fascinating talk titled “How to ride a laser beam”. He pointed out that the force of the laser hitting a flat sail could send it spiraling off course, so it may be necessary to use a spherical sail to stay on track for Proxima. This itself presents new challenges that have yet to be solved, such as how to spread the force of the laser over the whole sail. Even if the spacecraft gets there, sending data back is also a huge issue. The chip at its center will be barely a gram in weight, with the sail mere atoms thick. Thus there will be no room for an antenna to transmit data – including images of the planet – back to our planet. Some novel ideas include using the sail itself as a giant antenna, although we don’t yet know if this is possible. And even if we get there, the flyby will be extremely brief. René Heller from the Max Planck Institute for Solar System Research in Germany said in a talk how, after 20 years of travel, the flyby would last just a matter of seconds. He instead proposed using Proxima’s companion stars, Alpha Centauri A and B, to slow down the spacecraft and enter orbit around Proxima b, something that would return much more data at the cost of a much longer mission. We’ve covered this interstellar roundtrip idea before if you want some more information. But even if Starshot never gets off the ground, it is at least inspiring some critical thinking in the area of interstellar travel that has not been explored before. Even materials science stands to benefit, with Heller showing off a small piece of graphene that could be used to develop giant sails for traversing the Solar System and beyond. And Yuri Milner himself seems anything but disheartened, explaining his ethos in a fascinating but sadly off-the-record discussion with IFLScience and other journalists. He remains committed to the cause though, and clearly wants to be part of a discovery that makes life on another planet a possibility, whether that’s humanity or an alien race. “Breakthrough Discuss boldly demonstrated that we stand on the precipice of making one of the most amazing discoveries in the history of humanity,” Siemion told IFLScience. For every speculative fantasy, the conference remained mostly grounded in science. If we are to discover we are not alone, the people who’ll find out were very likely here.